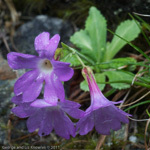 Primula membranifolia Franch., Bull. Soc. Bot. France 33: 68. 1886 . Type specimen: Forrest 18875 resides at Paris (specimens P04544200, P04544198, P04544201) and Royal Botanic Garden Edinburgh (specimen E00024149) and British Museum (specimen BM000996911) and KEW (specimens K000750068, K000750070) and New York Botanic Garden (specimen 329546). P. longituba (syn): Forrest, Notes Roy. Bot. Gard. Edinburgh. 4: 226. 1908. Type specimen: Forrest 1809 resides at Royal Botanic Garden Edinburgh (specimen not scanned, see plate XXXVII). Epithet: Named for the membranous leaves. This species is well known from the Cang Shan, near Dali, Yunnan. It grows in mossy crevices of damp limestone rocks. Similar to P. yunnanensis but with a longer corolla tube and obscured veins on the calyx. Leaves obovate to spathulate, rounded at the apex, base tapering into a winged petiole, often short but sometimes as long as the blade, membranous, crenate-dentate at the margin, efarinose or slightly farinose above, densely yellow farinose below. Scape 2-5cm, yellow farinose, with flowers 1-9 violet-rose with a white center and yellow-green eye and exannulate. See related P. scopulorum, P. kialensis and P. yunnanensis.